The scientists agree; the California wildfires are made worse by record heat, drought, and low humidity. The death toll from the Camp Fire is now up to 63 and the list of missing people is up to 631. We think it’s bad now at 1C global warming; wait until we hit 1.5C or 2C. We have known that this would happen for decades; we dillied and we dallied and now here we are, with many more billions of people completely dependent on fossil fuels. How many of us can re-learn how to live sustainably on the land? Is there any land left unspoiled enough to sustain us? Looks like we’ll find out sooner than later. 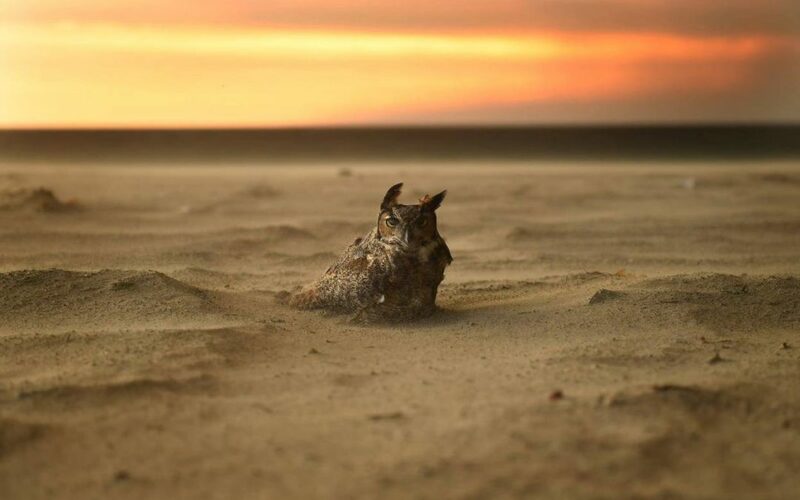 Photo of a great horned owl on the Malibu beach taking refuge from wildfire, by Wally Skalij of the Los Angeles Times. Kenn Orphan writes: “This particular photo has a haunting, even iconic, quality. It is captivating. The owl almost seems to be looking at us inquisitively as if to say “what have you and your kind done to my world?” It is a stark and sobering reminder to us homo sapiens that this planet does not only belong to us, it belongs to a myriad of species, most of whom we shall never see or hear about.